Summer presents so many opportunities for entertaining outdoors. 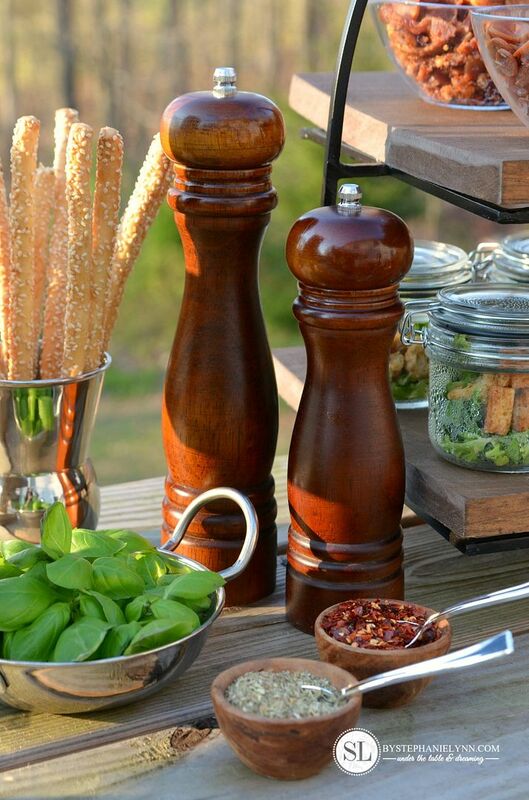 Simple food, exceptional weather and a relaxed atmosphere are the prefect components for any social gathering. 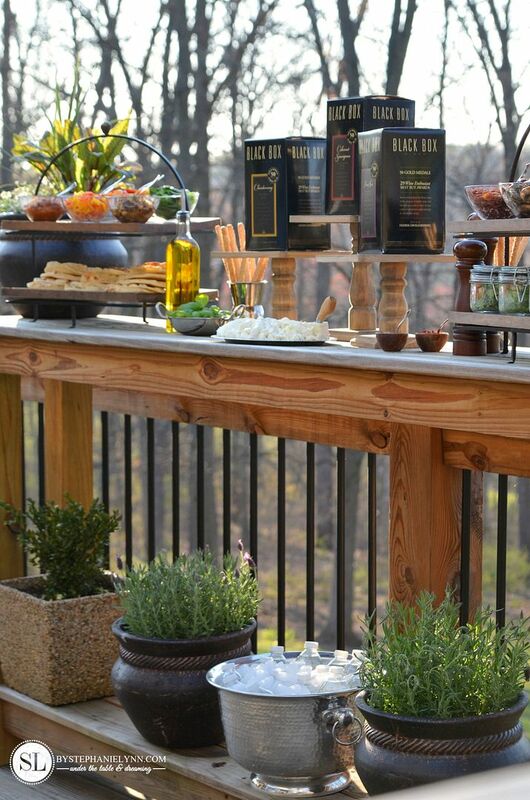 Take full advantage of the grill this summer and host an Outdoor Wine and Pizza Bar Party. 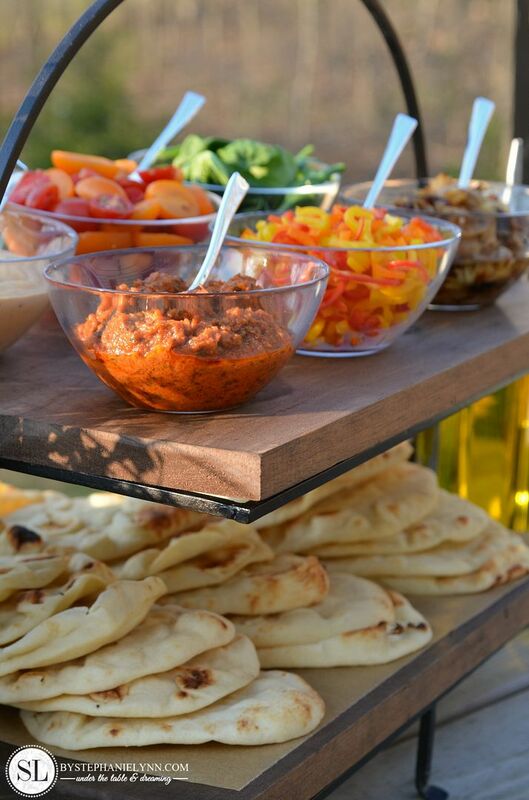 Classy meets casual with this hands-on food bar that transforms your typical pizza menu into a playful and stylish, interactive experience. 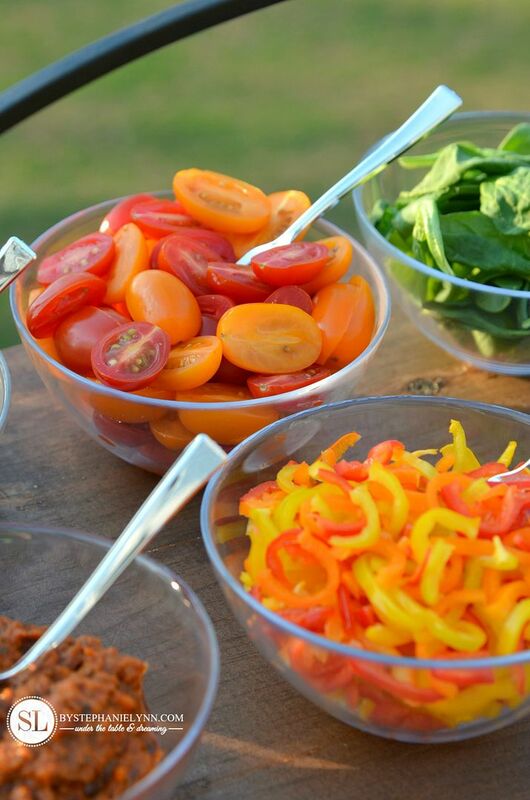 The wine and pizza bar gives guests the option to create their own customized grilled pizza, paired with a selection of premium wines. 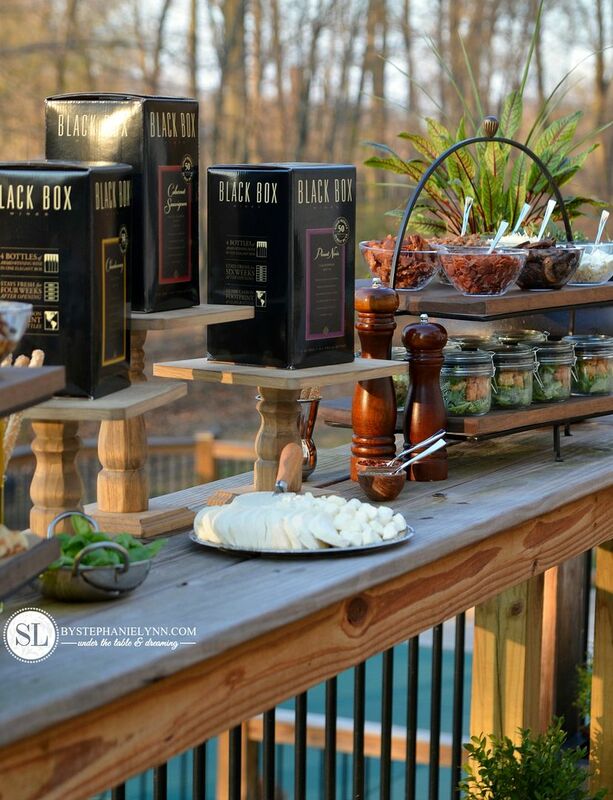 The menu is not only a satisfying meal, but simple to put together – as all of the preparation for this Outdoor Wine and Pizza Bar Party can be completed in advance. 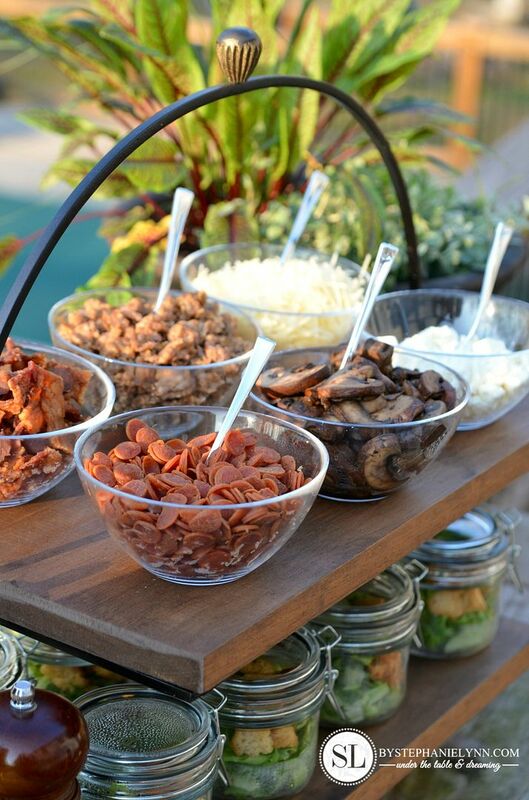 When choosing pizza toppings for the bar think about the wine selections being offered during the party. 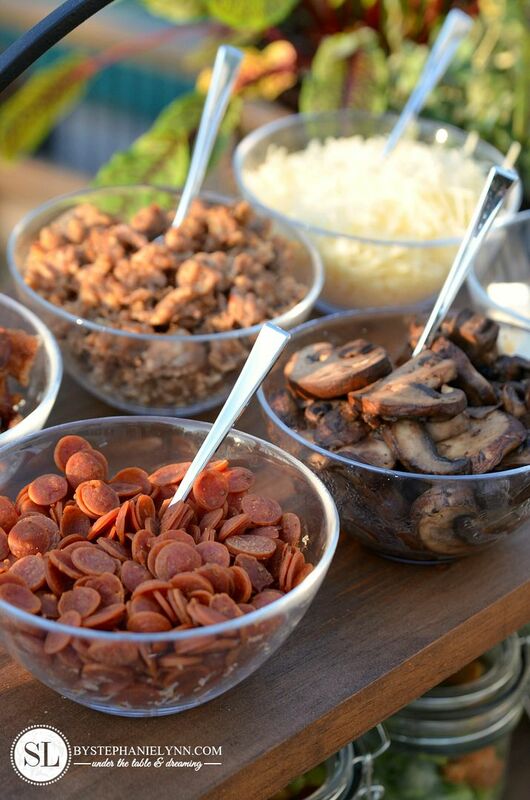 Although guests will ultimately customize their pizza with their own personal favorites – it’s fun to encourage guests to step outside the norm and try some pairings that elevate the tasting experience. 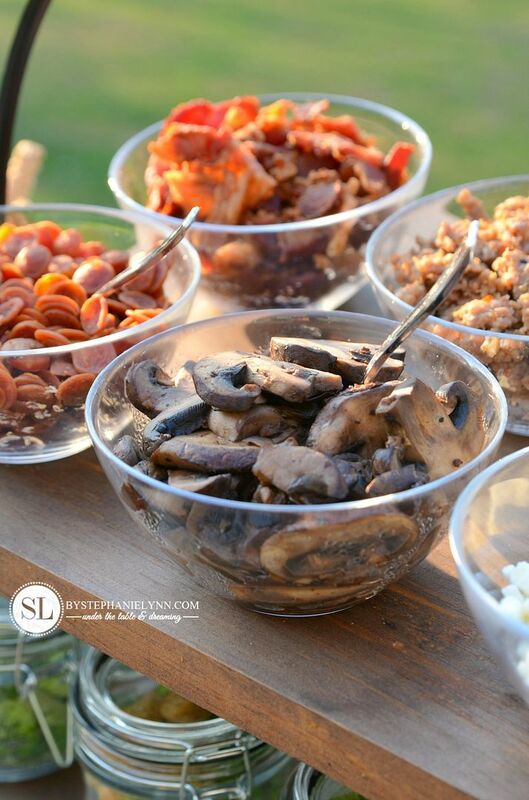 Compliment the hearty flavors of a mushroom and pepperoni with a full bodied Cabernet Sauvignon. Elevate the natural creamy notes of white pizza with a rich Chardonnay. 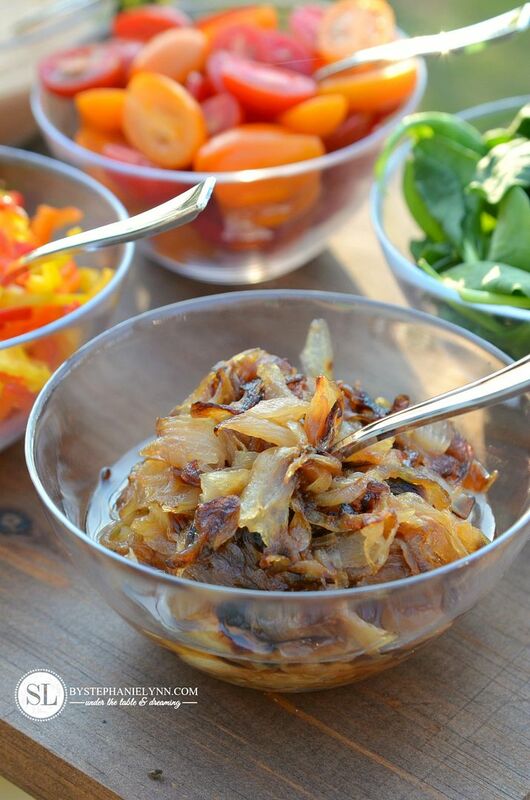 Pair the complex flavors of a veggie pizza with a delicate Pinot Noir. 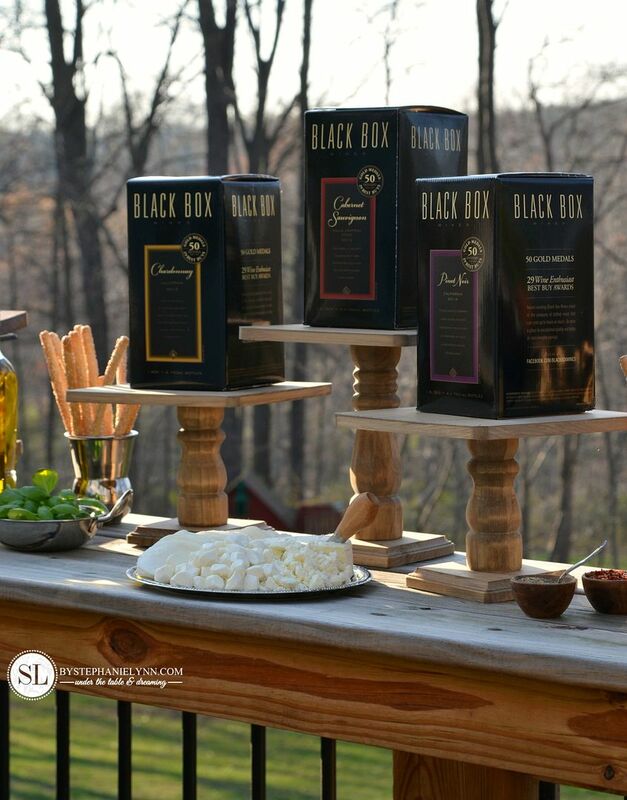 Our Outdoor Wine and Pizza Bar Party consisted of three Black Box Wines, eight different pizza toppings, two sauces, and four cheese selections. 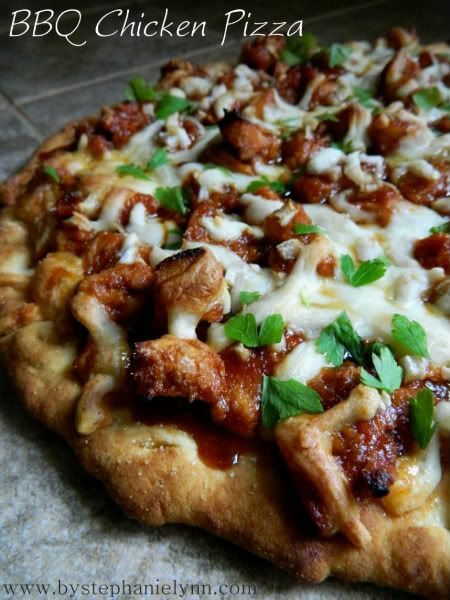 Fresh pizza dough can be prepared the night before or opt for pre-made flat bread for convenience. 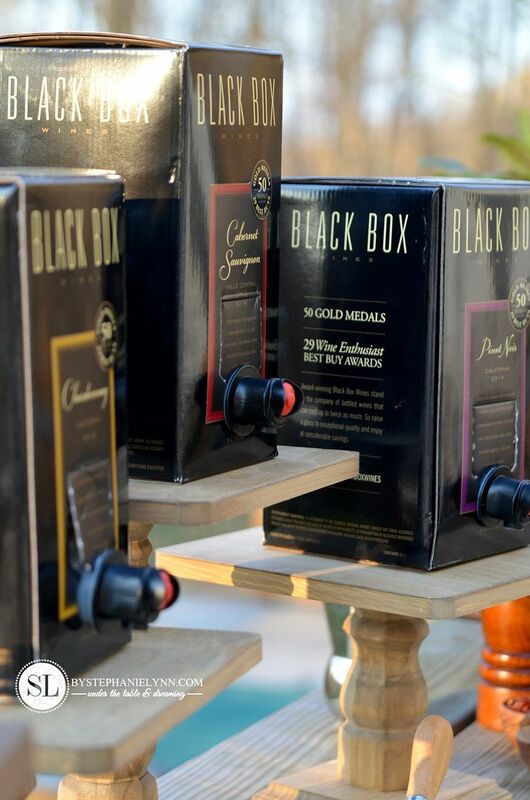 Black Box Wines are the perfect fit for parties as each eco-friendly bag and box contains the same amount of wine as four 750ml bottles. 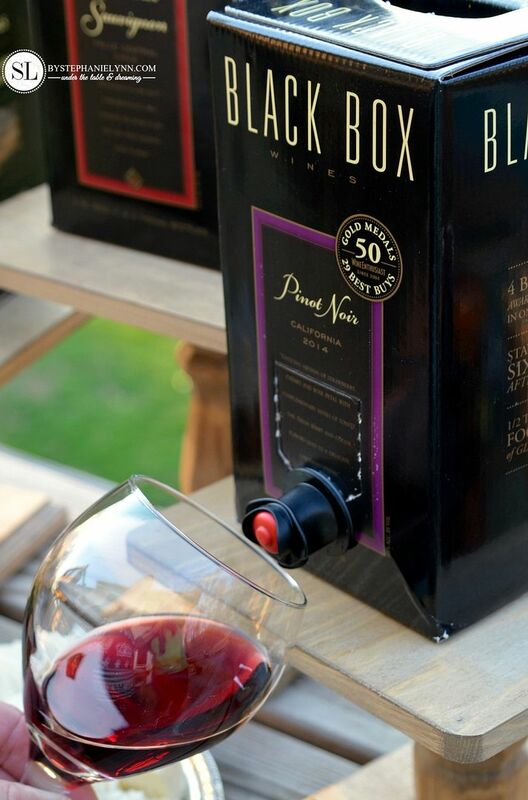 Black Box Wines also stay fresh for six weeks, making the first glass as fresh as the last. Our selections included three Black Box World Class Wines: a California Pinot Noir, Cabernet Sauvignon from Chile, and a Chardonnay from Monterey County. 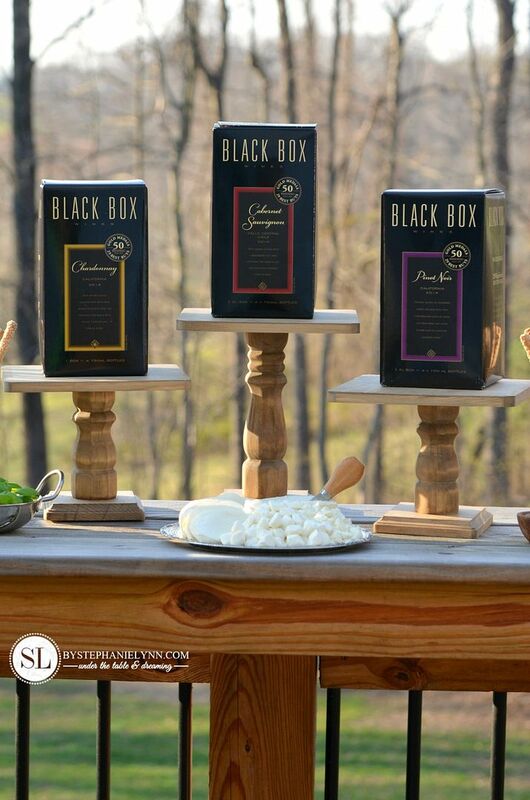 For easy serving, we perched our Black Box Wines on top of some wooden dessert stands. Since grilled pizzas bake quickly, it’s a good idea to pre-cook all of the meat toppings ahead of time to ensure they are throughly done. 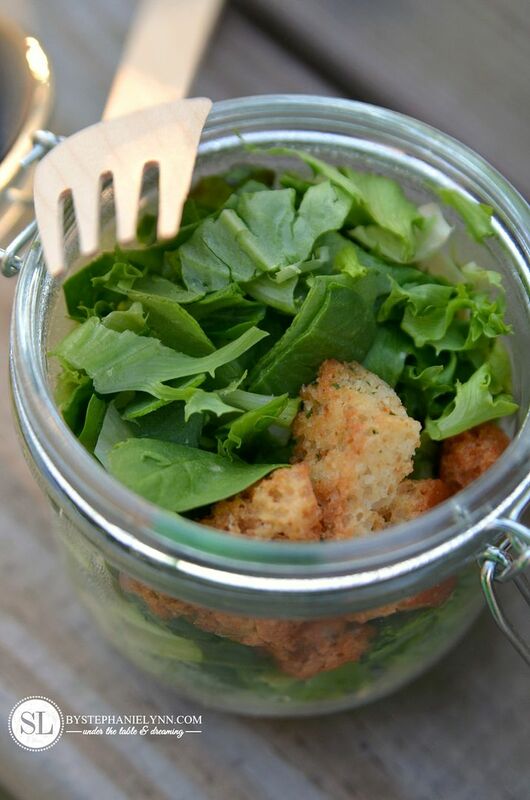 Small salads were prepared to compliment the pizza menu. 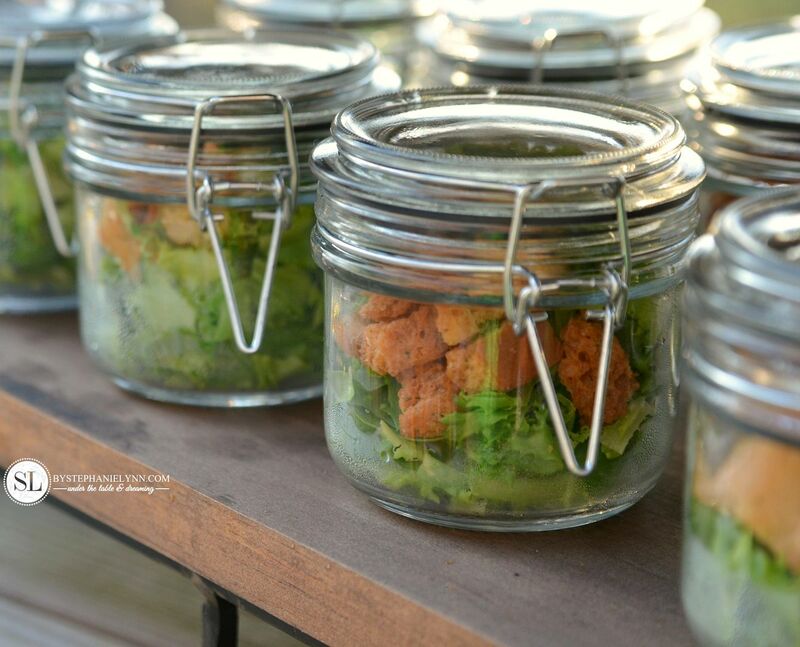 The salad was tucked into small mason jars for quick, grab and go outdoor convenience. 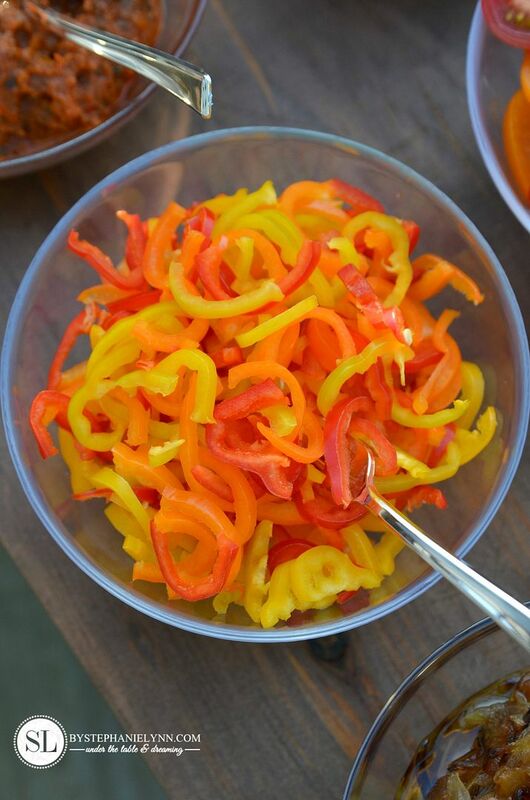 Make sure the grill is fired up ahead of time and ready to go. 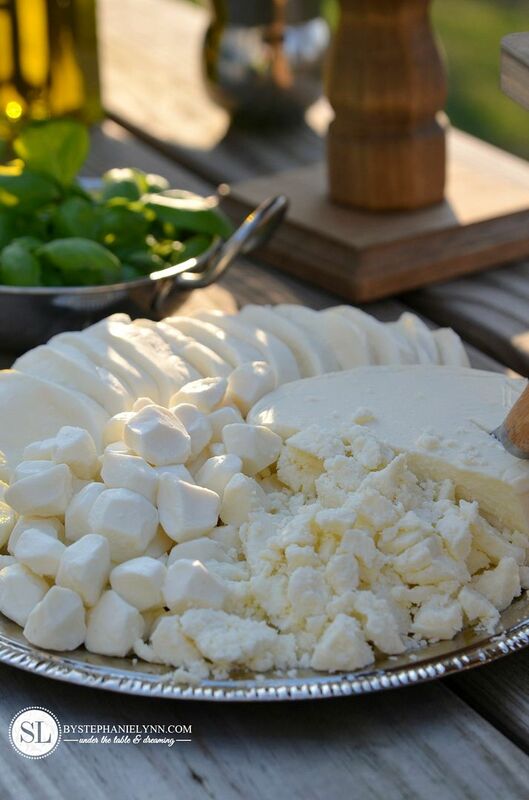 Small wooden cutting boards, or actual pizza peels, make great surfaces for each guest to prepare their pizzas and transfer them directly to the grill. 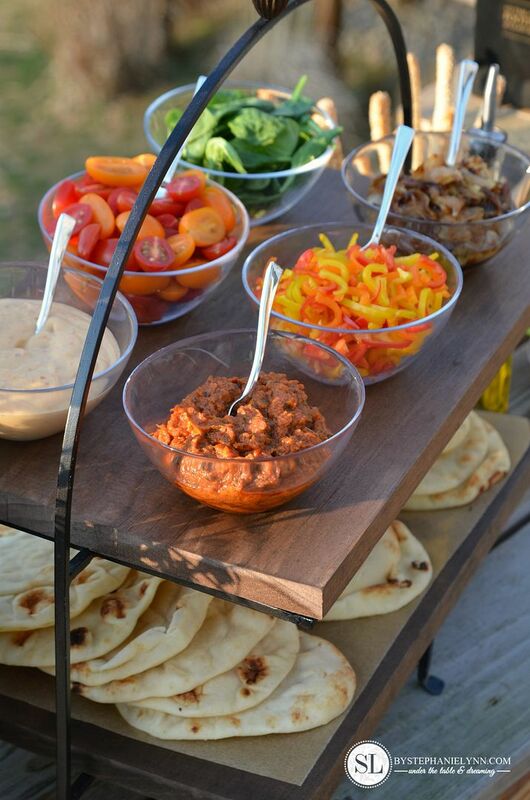 This is one party you can forgo the dinnerware, as the individual cutting boards can also double for serving. 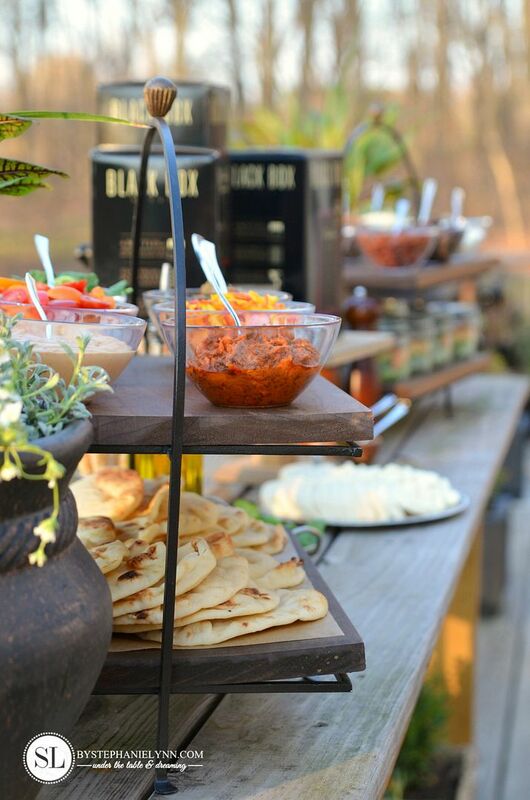 One of the joys of hosting an Outdoor Wine and Pizza Bar Party is the fact that guests can fill their glasses and socialize, in one convenient area during the whole preparation and cooking process. 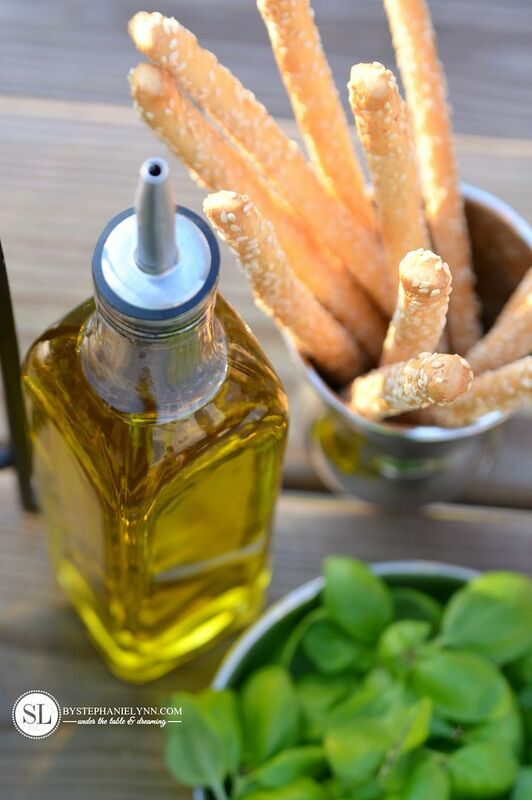 While suggesting new wine and pizza pairings is fun and exciting, keep in mind the guests are going to be creating the best combinations, composed of flavors and tastes that they individually love. Keep it simple, casual and have fun! 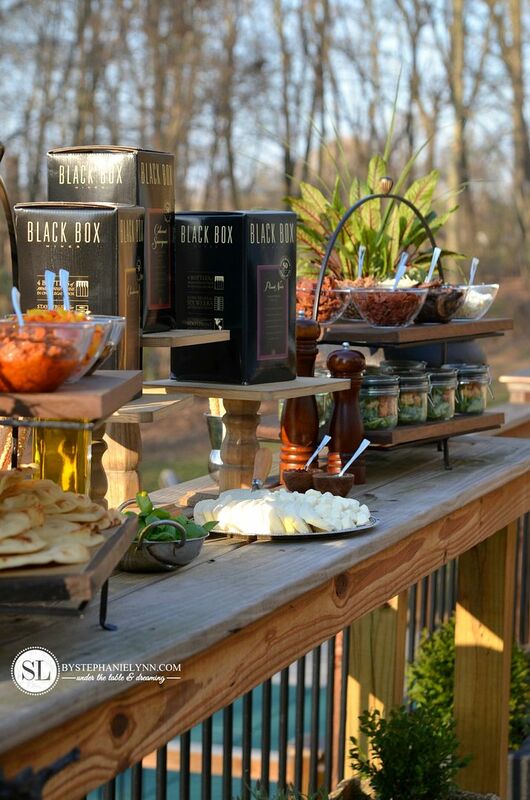 Are you ready for some outdoor entertaining this summer? 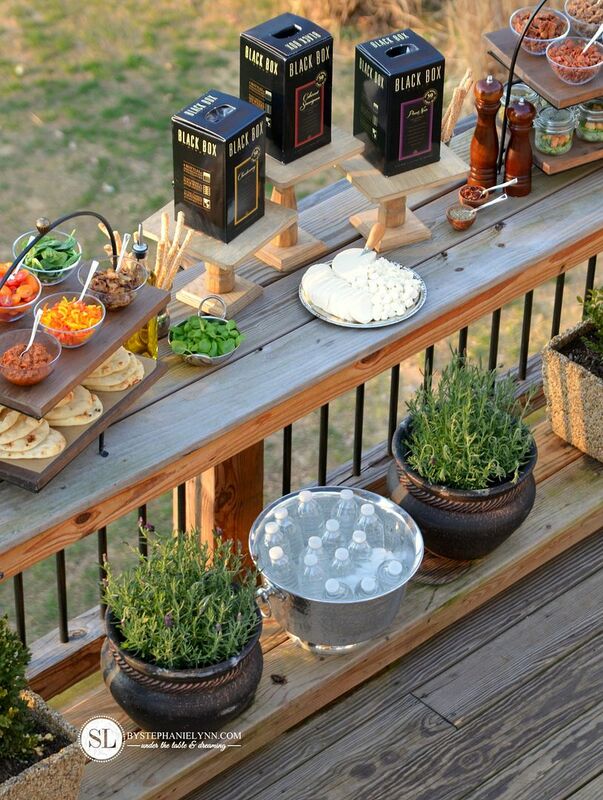 Thinking of hosting your own Outdoor Wine and Pizza Bar Party? 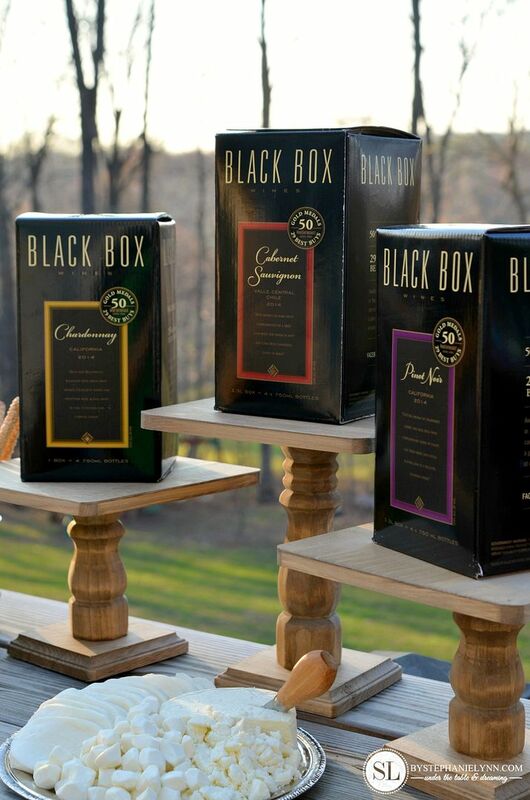 Black Box Wines has not only won over 50 Gold Medals for its quality, but is the winner of 29 Wine Enthusiast Best Buys. 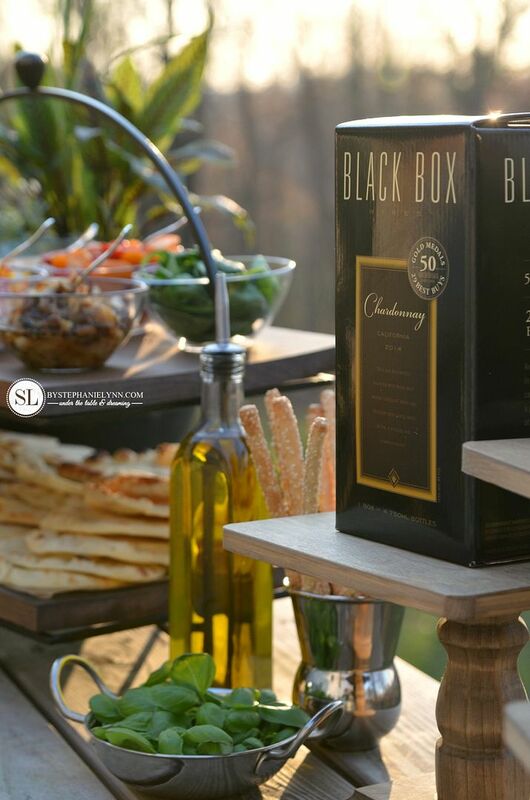 One box contains the same amount of wine as four 750ml bottles, available for 40% less than comparable brands – making Black Box the smart choice for your next summer soirée. 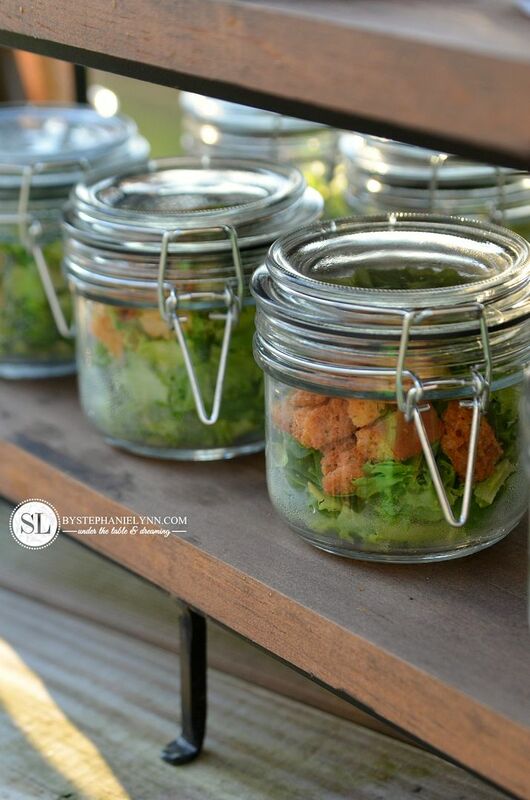 For more great entertaining ideas visit the Simple Entertaining Social Hub. Love it!!! Your setup is gorgeous and the ideas are great!! Where did you find the double tier stands? I pinned the tutorial on the cake stands! Hi! What a beautiful set up! Question, where did you find the tiered stands? I have been looking for something just like this, as opposed to all the round ones everywhere! Thanks! Hi Jennifer – I have had the stands for years. For this particular set up I simply replaced the patters with cut pieces of wood. I have tried to look online for something similar to share without any luck. 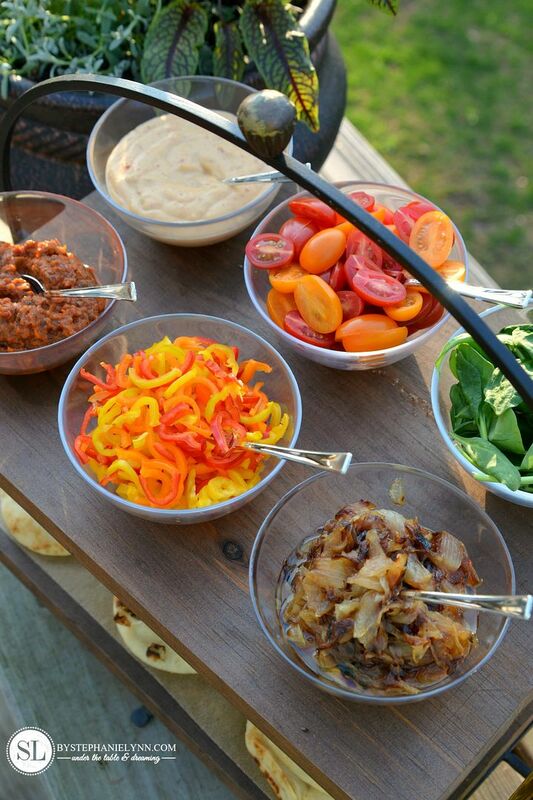 Outdoor parties are always exciting. But sometimes I have no idea how to serve the dishes so that they could stay fresh. 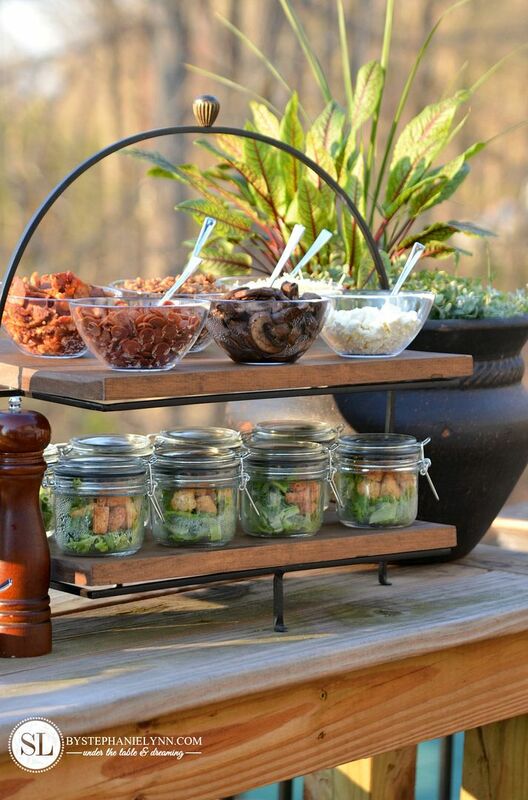 I like your idea with salad serving. On the one hand you see what is inside, in the other hand they are closed. Wonderful! Where are your buffet servers from? Thanks! I have had the servers for years. 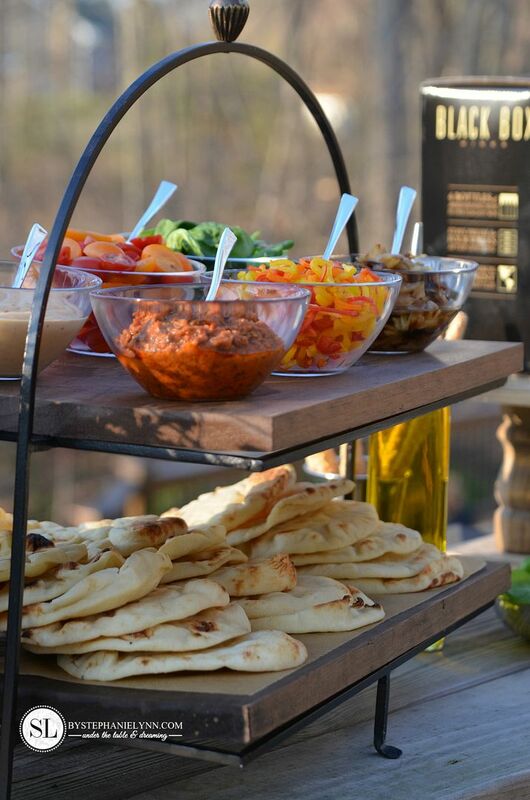 I replaced the platters with pieces of wood for this party. How do you get the cheese to melt on the pizza? 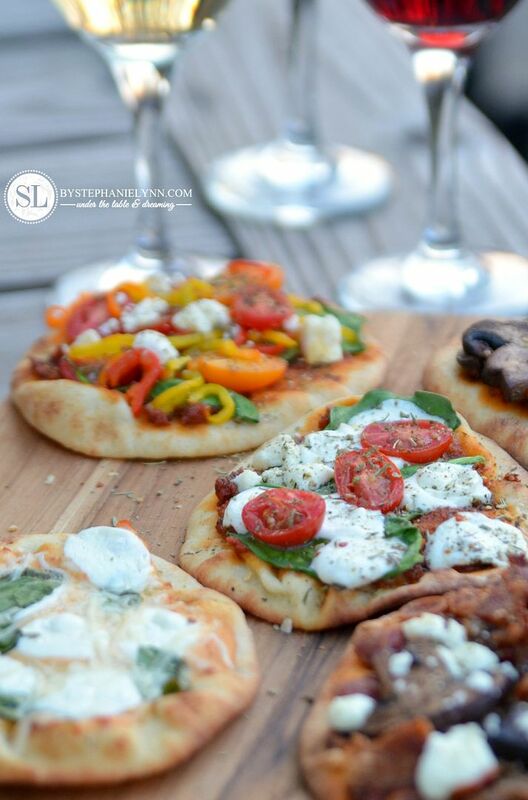 Do you have a picture of the pizzas on the grill? Was is a gas grill or coal? Did you put the bread directly on the grill? Hi Nikita, These were cooked on a gas grill. 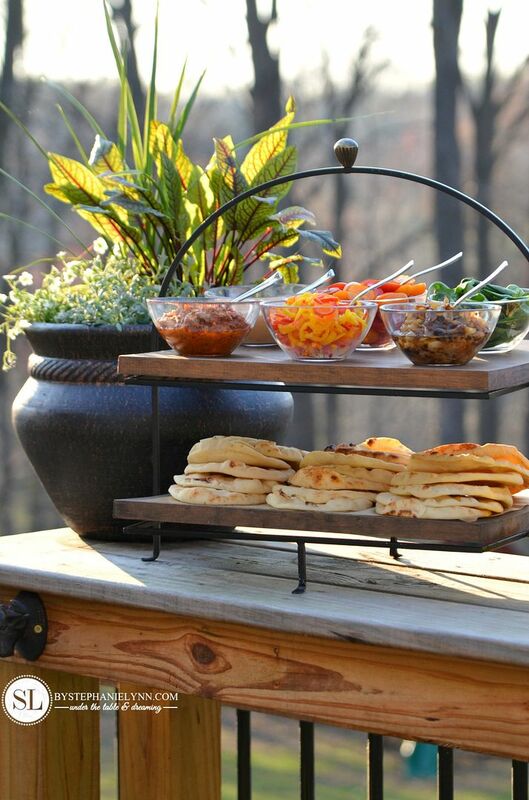 With a gas grill you are able to control the temperature a little better – so the crusts do not burn. The crusts were tossed directly on the grill grates before hand to make them crisp. Then, once they were customized with toppings, they were placed back onto the grill (with the lid closed) until the cheese melted. 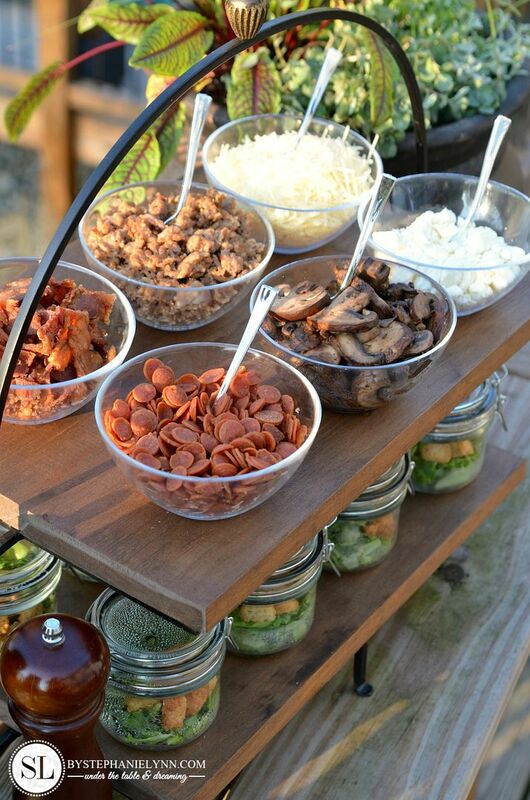 Is there any cooking involved after the guests build their pizza? Grill? Looks like a beautiful setting! Thank you Jennifer. 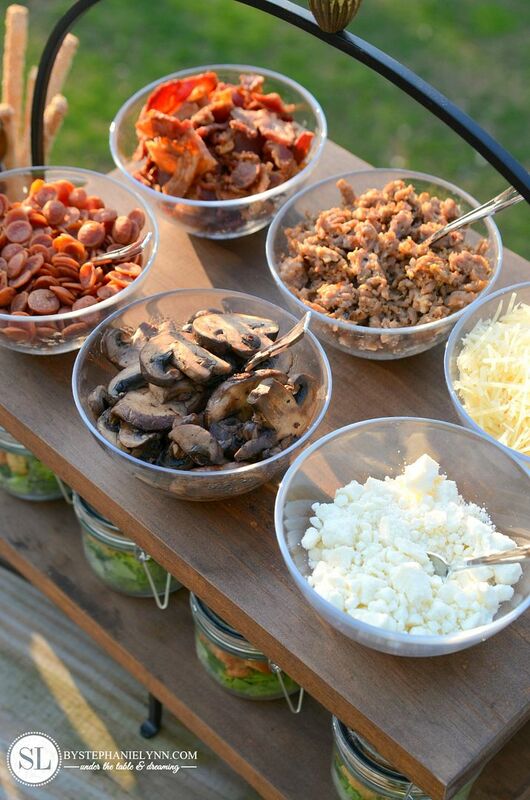 Yes, once the guests customized their pizzas, they were tossed back onto the grill, until the cheese melted. 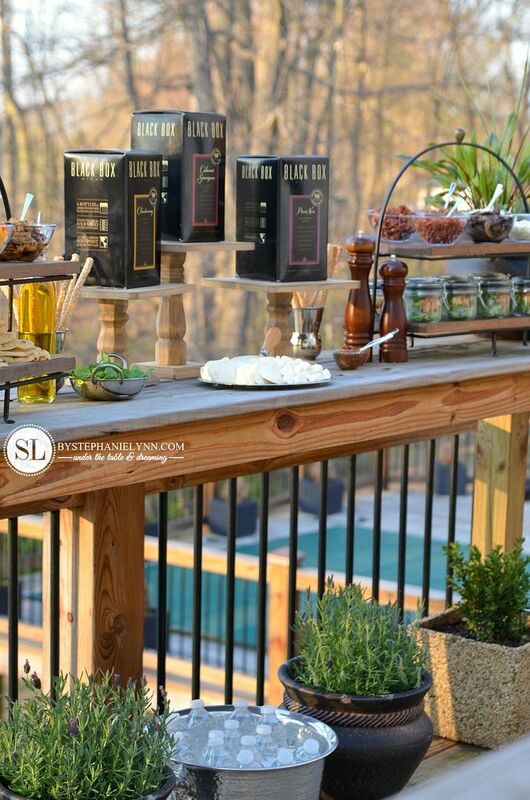 This does not take long and of course, since the party is outdoors the atmosphere makes for casual setting where timing wasn’t an issue – as the guests can socialize and hang out. I was wondering the same things..how the pizza got cook and where did you get the stands? Hi Patricia. I have had the stands for years. 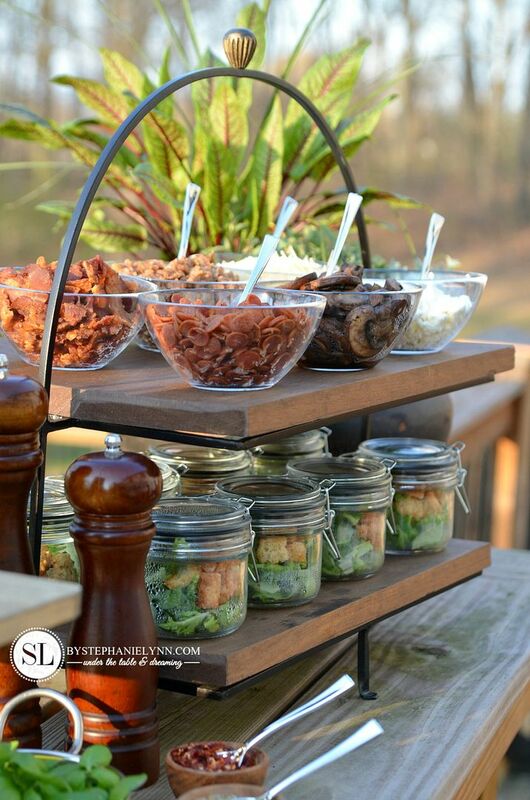 I took the platters off for this set up and replace them with wood for a rustic feel. To cook the pizzas the crusts were tossed on the grill before hand to make them crisp. Then, once they were customized with toppings, they were placed back onto the grill (with the lid closed) until the cheese melted. So much beauty in each picture! I bet this makes for a memorable evening! This looks fabulous! I can’t wait to try it. Thanks for the great ideas! How did you do the crusts? 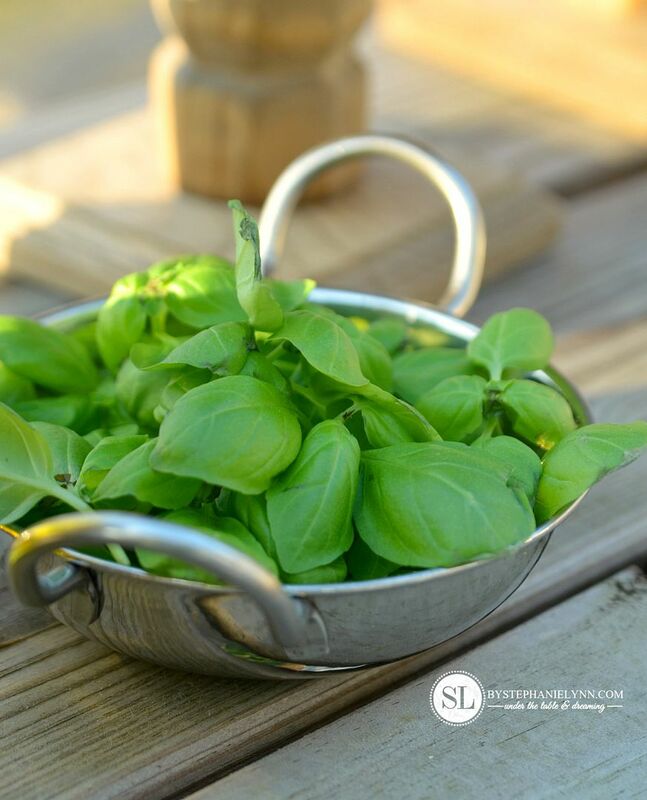 Did you grill them before hand and reheat them on the grill? 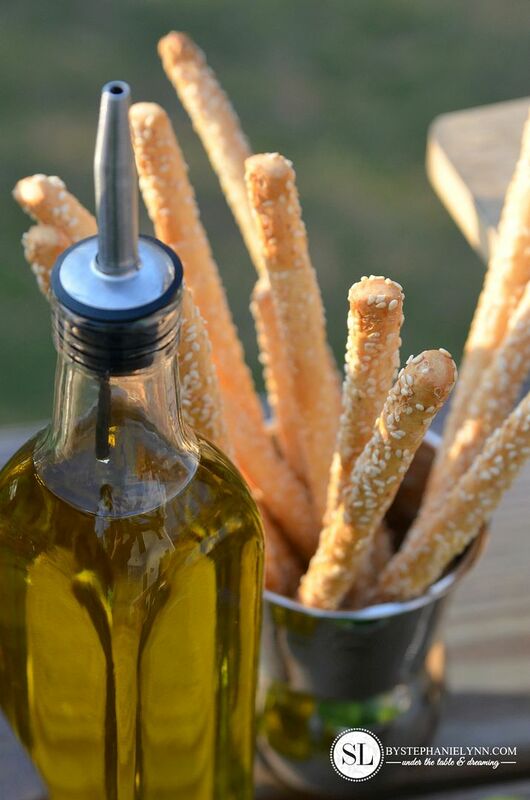 The crusts were tossed on the grill before hand to make them crisp. Then, once they were customized with toppings, they were placed back onto the grill (with the lid closed) until the cheese melted.